Many of you know Jeanine and I are sisters. We're the two oldest in our family. 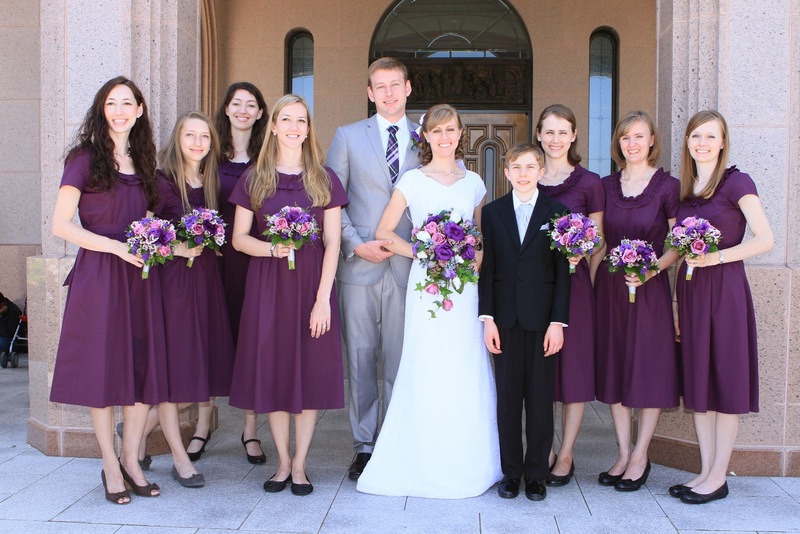 But many of you probably don't know that we have two younger sisters too. 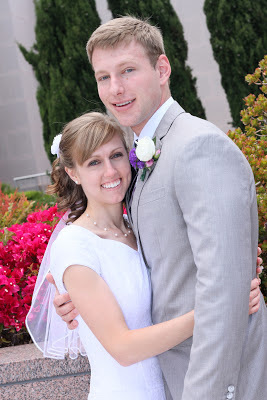 This spring our youngest sister Rachelle got married to a sharp young man, Scott. Aren't they cute? Pinterest comes in super handy for things like weddings. All us girls brainstormed and looked around for wedding items together and when we found a possibility we pinned it on a group pin board. It was a lot of fun. Rachelle decided that she would have her's and Scott sisters be the bridesmaids. That's seven sisters total! 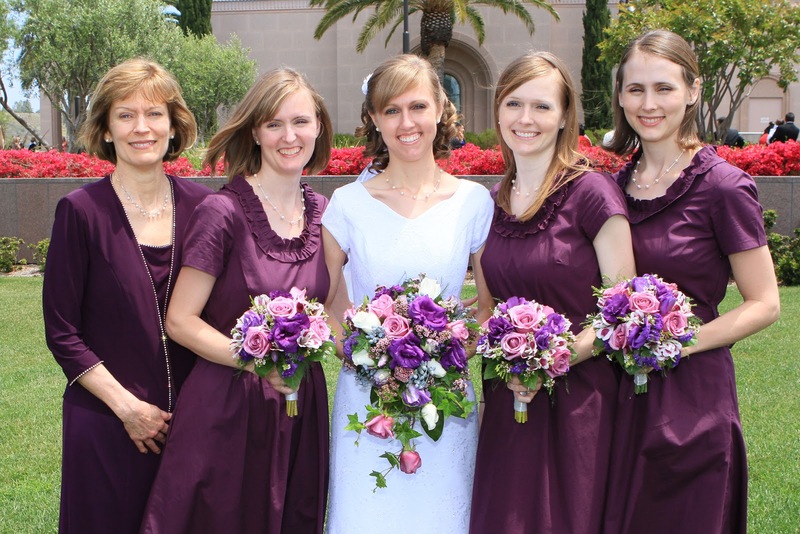 Finding a bridesmaid dress wasn't easy with the range of sizes we had to accommodate. From Jeanine's short 5'4" to Scott's very tall six foot sisters. What were we going to do? Then we found eShakti! This site was the best find. Not only does it have darling dresses, but you can customize it to fit your size and style, all for an affordable price! This is the dress we found on the website, but we added sleeves and extended the hem to below the knee and ended up with . . . These perfect dresses that fit everyone perfectly! 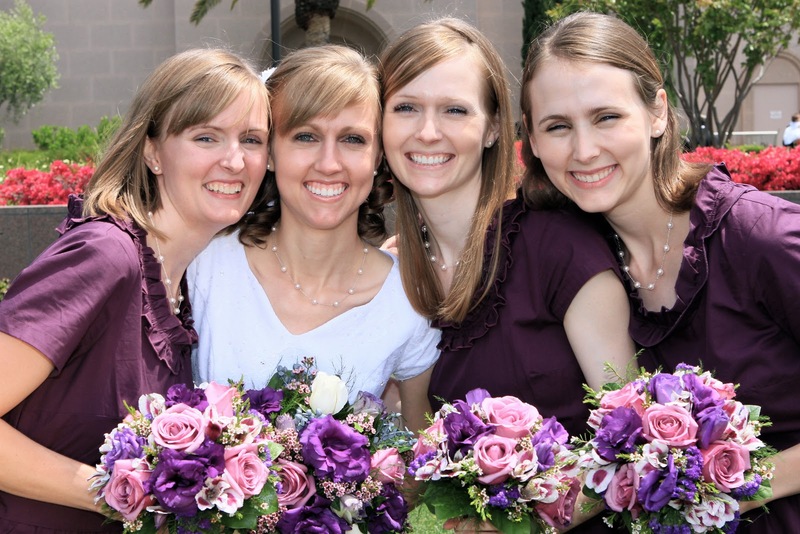 The lovely bride with her mom and sisters. Aren't they cute dresses? 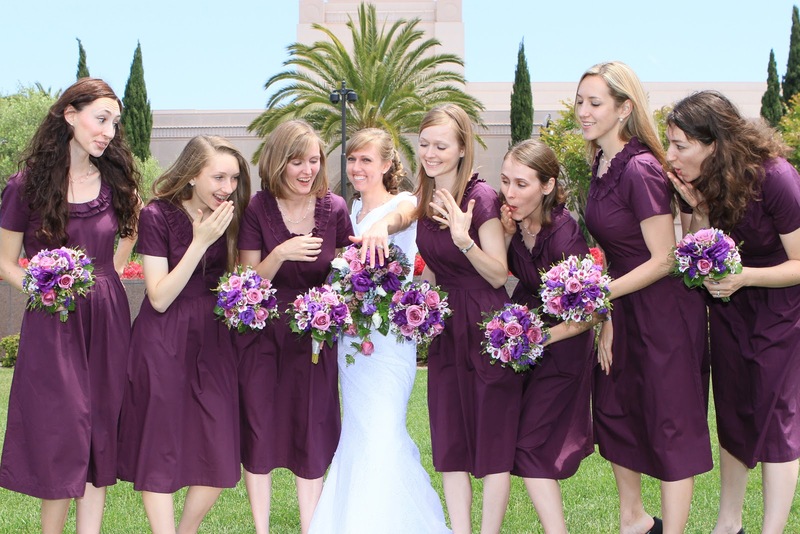 This is one bridesmaid dress that I'll wear again and again. Can you believe all these girls? 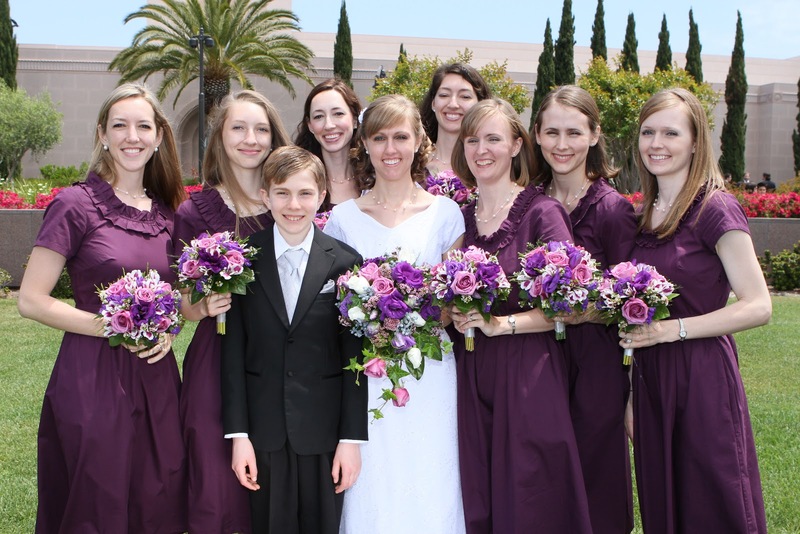 And our younger brother Jacob, the lonely groomsman. He sure is spoiled with all these big sisters. 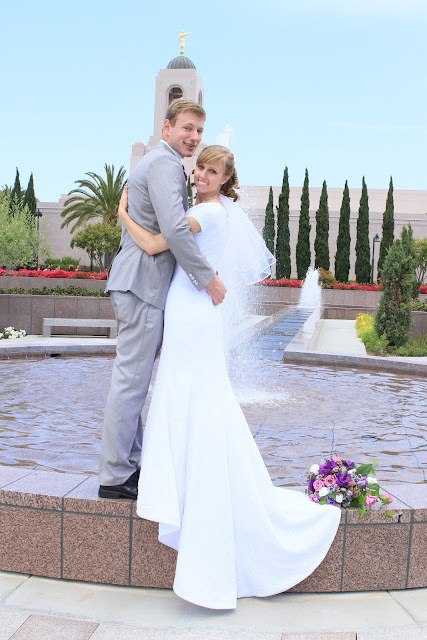 We loved our experience with eShakti and we love all the cute dresses they sell. 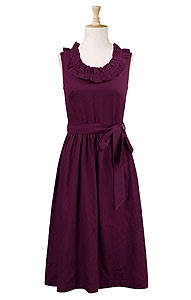 With the holidays coming up there always seems to be a need for a new dress to wear. We would love for you to check eShakti out and give them a try too. Right now you can get $25 off your first purchase by entering the code AMYPINCOCK at checkout. And congratulations to Scott and Rachelle. We're so happy for you!